I thought it would be a nice change to do a Blue View on Blue, our Ford Transit 148WB van. As our nephew, Eric, pointed out, the 'Blue View' takes on a whole new meaning now that we are beginning the van conversion project. I've been thinking about the van layout since the whole idea was just a glimmer in our eyes. Now that we're back in Las Vegas for a few weeks - taking a break from boat work - I've had the time to begin the van layout process in earnest. 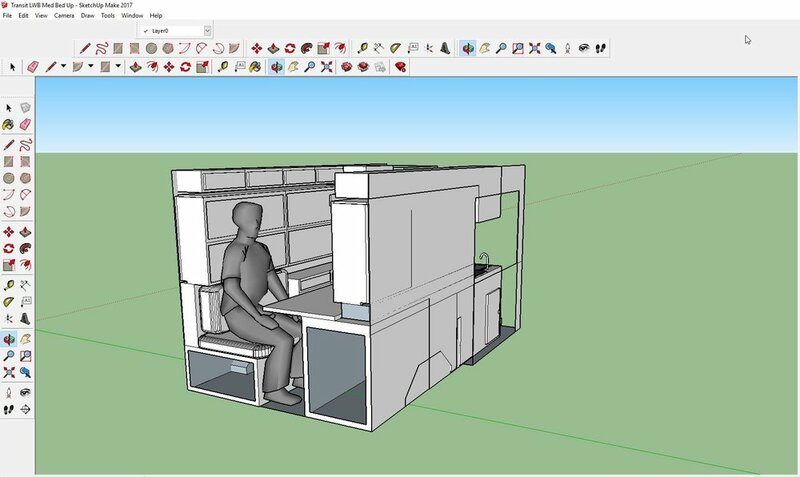 I found a very nice 3-D CAD program called Sketch-Up, and the free version has enough capability to do most of my layout work. They have some great tutorials, and it took about a day to learn the basics of how to use it. It is quite helpful in planning the interior. As with any project, a good place to start is by stating the requirements. I won't discuss why we chose a van versus a larger RV, since this was the topic of an earlier blog. Instead, I'll talk about what's important to us in our van layout. Bed: When we were young and did a lot of backpacking, we were quite happy sleeping on the ground. In middle age, we added granny pads – then air mattresses. Now, we would really like a comfortable bed. If we were using Blue for the occasional weekend camping trip, we'd be more flexible, but since we plan to live in Blue for months at a time, it needs to have a good mattress. We also want to be able to keep the bed made up – not fold and stow the sheets and blankets every morning, then reverse the process every night. Another consideration is our differing sleep schedules. I tend to stay up later and like to do my writing in the evening, while Marcie is the early riser and is full of energy while I'm barely coherent. Bearing this in mind, it would be nice if there was a place to sit and work that was separate from the bed. When were looking for the van, we thought the high roof model would be the best for us, and I thought that having the ability to raise the bed to the ceiling when not in use might be the answer. Because of several trade-offs, however, we decided instead on the mid-height model, and there isn't enough headroom to take the raised bed approach. I now think a nice solution is to have two small Murphy beds that fold down from each side, forming one double bed. We can make the beds each morning, then simply fold them back against the wall during the day. Settee and Table: We need enough space for the two of us to sit together and a table that is big enough that we can eat or set up our laptops and work. The settee should be comfortable enough to sit on for hours at a time. Toilet: We want an onboard toilet. 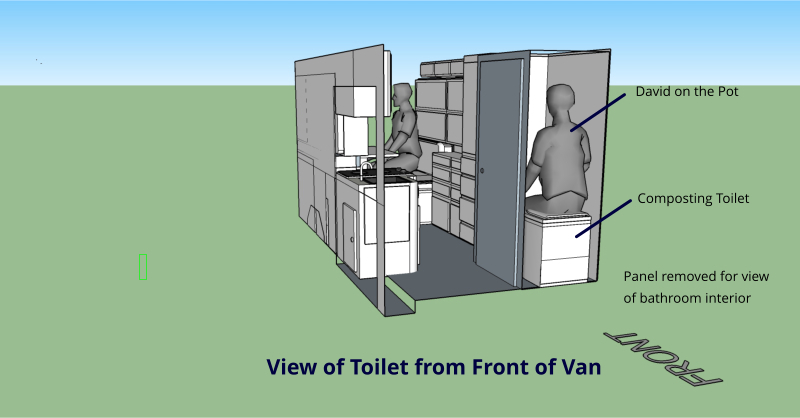 We've looked at RV/marine type heads that require a holding tank, 'Port-a-Potty' and canister type toilets that have the holding tanks built in, and composting heads. There is no ideal solution – all require compromises. Currently, we are planning on using a composting head. It has several nice aspects, the two major ones being they are self-contained and they don't smell. We also want an enclosed space for the toilet. After all these years together, Marcie is still shy about doing her business without having a small amount of privacy. As for me, the privacy aspect isn't that critical. On the other hand, and this is bordering on TMI, my poo has to be the worst smelling on the planet – peel the wallpaper off the wall kind of stink, and having an enclosed space with a vent may be an essential part of onboard harmony. 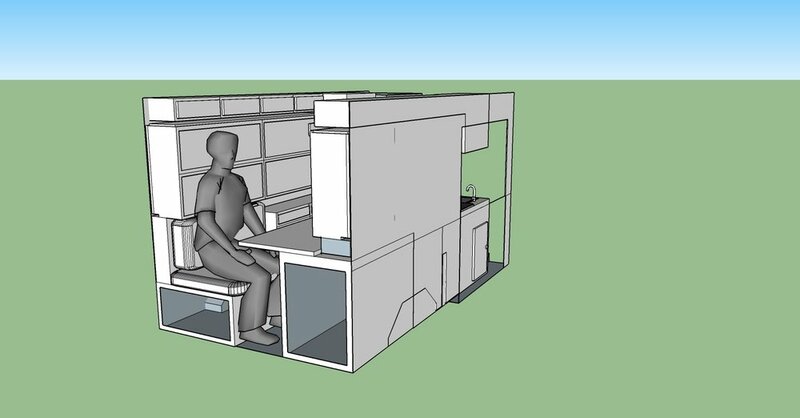 I used Sketch-Up to design the toilet space, then constructed a 'simulation head', which we both sat in “simulating” to make sure we could make it work. Fridge/Freezer: On Nine of Cups, we've gone long periods without either, and for many years with only a fridge. Now we have a working version of both, and on the whole, this is what we prefer. We'll probably re-purpose the portable unit that's presently our backup fridge/freezer aboard Cups. The trade-offs are the same as on a boat – capacity vs size vs power consumption. The unit currently on Cups has a nice capacity – 62 liters, and I can find a place to put in on Blue. The downside is that it uses about 60 amp-hours per day on 12 volts. This will be the largest power hog on Blue – although our two laptops will be a close second if we are spending the day writing. We'll need to add solar panels and a few batteries to support it and our other off-grid electrical needs – a topic for a future blog. Galley: At the very least, we need a stove and a sink. We are debating on an oven and/or convection oven/microwave. The oven requires precious space and the latter requires space plus a lot of power. We may make provision for one or the other to be added later and see how important it is after living aboard awhile. We do use our oven a lot on Cups, especially when the weather is cooler, so we'll see how this plays out. Since we already have diesel aboard, we were contemplating one of the new diesel cooktops. Because of the cost, complexity, 15 minute warm-up time and the possible unreliability at high altitudes, we're now opting for a propane cooktop. As for the sink, we've seen a lot of Lilliputian sized sinks for RVs, but these seem inadequate for actually washing a pan or dishes in. They may be fine for brushing our teeth, but not much more, and we've opted for a bigger sink. Hanging Locker: It doesn't have to be huge, but a small locker for hanging shirts and jackets would be nice. Storage: We went through Cups one day and started listing all the things we store aboard, and it's a lot. We won't need as many spares or tools (did I just say that? ), and we won't need to provision for months at a time, but we still need a lot of stuff – paper towels, toilet paper, clothes, toiletries, dishes, pots, pans, pot holders, silver, utensils, wine, beer, water, canned goods, dry goods, oil, vinegar, medical kit, spices, batteries, towels, dishcloths, facecloths, laundry detergent, dirty laundry bag or bin, laptops, chargers, power cords, mixing bowls, coffee cups, office supplies, cleaning supplies, suitcase/duffels for travel, backpacks, foil, plastic wrap, ziplocs, trash bags, blankets, sheets, ... It's a long list, even if we pare down considerably. I'll try to utilize every available inch for storage. Shower: We have a dual purpose shower room on Cups – it serves as the toilet and sink space or as a shower. Seemed like a good idea until we got tired of wiping down the entire area after each shower before it could be used as a head again. That, coupled with the limited supply of water, dissuaded us from using it much. At anchor, we would go for a dip, then use the cockpit shower to rinse off. On passages, we usually opted to take 'kettle showers' – heat water in a kettle, then wash our hair and bodies at the galley sink. Not bad once we got the system organized, and it typically used less than half a gallon of water. When in a marina or boatyard, we would use the common shower room. Blue will have even less water available than Cups, and I can't see us wanting or needing a shower facility. We'll make do with kettle showers and the occasional RV park shower. We like the layout, but I'm sure it will continue to be tweaked. We invite anyone who has thoughts and suggestions to give us some feedback. It's much easier to correct oversights and mistakes and incorporate good ideas at this stage than once I start cutting things. Between planning Blue and finishing the boat projects, there will be no shortage of material for future Blue Views.